Rotherham duo Barry and Paul Elliott, famously known as ‘the Chuckle Brothers’, have become a household name after ChuckleVision, one of the most successful children’s television show of all time, which made them some of the most recognisable faces on television. It is clear that over the years they seem to have become the love or hate duo. 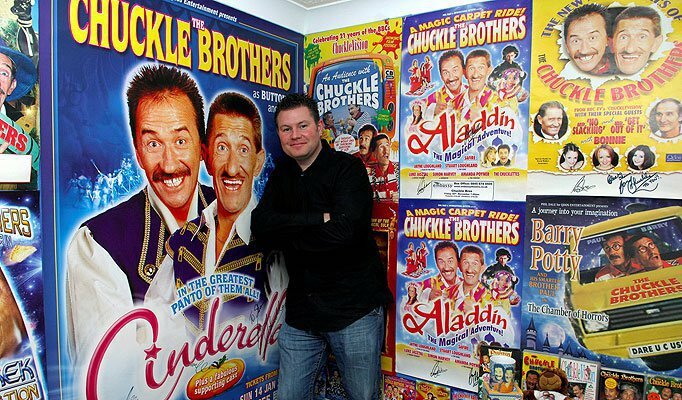 A huge lover of them is Darlington’s Shaun Hope, who has become famous for his collection of Chuckle Brothers memorabilia. How did you get your love for the Chuckle Brothers? I’ve always known I’ve liked the Chuckle Brothers and I went to a pantomime with my kids in school years ago when my son was four or five years old (he’s 18 now). After the show, they got us up on stage and got thrown custard pies in my face and then they gave us a few brochures, a picture, couple of badges, things like that. Then I went to see them again in pantomime and ended up on stage with them again and managed to get a poster and a few bits and bobs and it just went from there really. Me and my son started when I was 30 years old, but after a while it just became me. We got loads of stuff and I just started putting them in frames. Both are my sons are into Chuckle Brothers but now my son is in the army, so it is more or less me now. I’ve got the Chuckle Numbers number plate on the Chuckomobile, I’ve got ChuckleVision scripts and everything going really. Masks, keyrings, fridge magnets, jigsaws, mugs, wallets, postcards. How else do you show your love for the Chuckle Brothers? I am good friends with the Chuckle Brothers, and I go to see them about ten times a year. I think I have Barry and Paul’s number and I was on one of the their DVDs which is now in the shops, me and my two lads are sitting in the front row of that one. Tell us about the first time you met them. The first time I really met them was about six months later from that first show, and we just got our photos took, and our things signed. I didn’t really know them at this point, but once you see them a few times, they know who you are. How long did it take before you got familiar with them? They are quite good actually, they have got really good memories so it doesn’t taken them long to know who you are. I am known in the North East as ‘Shauny Chuckles’ because I work at a kid’s nursery so all the kids call me that. How do you deal with the negative reactions that your collection gets? What does your family think of it? My wife is not actually bothered really, we were on a show called ‘the Marriage Ref’ where she said she wanted to take the bedroom down and I wanted to leave it up but we just had to come up with that for the show. She’s not bothered really. She just lets us get on with it. But some of my collection is worth £20,000, that was the last time somebody valued it. That was about two years ago now. My grandson is seven months now so I hope the Chuckle Brothers are still going by the time so I can take him to a show. If someone said to you, “Who are the Chuckle Brothers?” what is your immediate reaction? I have never had that really because everybody knows who the Chuckle Brothers are. There was a big poll on the TV a few years ago and they had like Prime Ministers, racing car drivers, sports people and people were going “err that's an MP, that’s Beyonce, I’m not sure about that one” Yet everyone knew the Chuckle Brothers, not one person didn’t know who the Chuckle Brothers were. Even if you didn’t like them, you still knew who they are. If someone said “I hate the Chuckle Brothers.” or posted abusive comments, what is your immediate reaction? Also what about the newspaper scandals? Well they do it to everybody, like someone has put on that Barry was dead like a few months ago. So Barry had to put something out saying that he was still alive and I know that they are getting on a bit now. As with the scandals, at the end of the day he’s only human. I’m not really bothered everyone is different, it’s up to them if you don’t like them, there some people I can't stand so everyone to their own really. It’s amazing though, someone might say “Oh the Chuckle Brothers.” I’ve never had much grief really because everyone knows me well round here anyhow. Finally, what is your favourite piece of memorabilia? My favourite is a video that never got released from the Chuckle Brothers and that is worth an absolute fortune, so it’s incredibly rare. It is of a huge pantomime that they never got paid for, and there are only three of the videos in circulation and I bought one for about £50. If someone had this they would never sign, but they did it for me.